As is often the case in matters of fate, three essential elements had to come together before Moorhead Plastics and Silver Line boats could become a reality. The first of these was John Buckman. John Buckman had an eight-year history in the boating business. 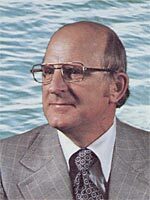 He began with Larson in the early 1950s and moved to Inland Marine as manager of the private label products division before getting the idea to start his own boat building business. By 1959, he was looking for a location and investors to get the ball rolling. Enter the Greater Moorhead Development Corporation. The organization was founded in January of 1958 to attract business and light industry, and the jobs they created, to Moorhead, Minnesota. When they caught wind of John Buckman’s plans of a boat building company, they convinced him that Moorhead was the perfect location. The Greater Moorhead Development Corporation contacted potential investors and provided land and buildings for the new factory to lease. Many of the members of the Development Corporation were also among the early investors. 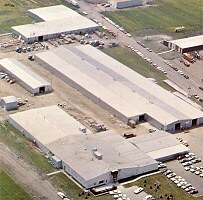 Moorhead Plastics was incorporated in August of 1959. From September, 1959 through February, 1960, while the factory buildings were under construction at the new Moorhead Industial Park, Buckman and a small crew built the first plugs and molds and finished the first 50 boats in a temporary building in Hawley, Minnesota, 25 miles to the east. The simple, deck-less fishing boats were named the “Free Way” line, while the sporty runabouts were called “Silver Line.” A top-of-the-line, 17-foot Silver Line sold for $1,395 while the 14-foot Free Way went for just $300. On February 15, 1960 the Moorhead factory officially opened and real production began. Buckman expected to sell 1,000 boats that first year, with an income goal of $400,000. But it was not to be. First year sales would only come to $146,300. By late 1960, investors were getting worried. No one really knew John Buckman, and the new company was into them for a lot of money. Nearly all of the initial investment capital was gone, and some suppliers were not getting paid. Without additional investment from the business community and banks, Moorhead Plastics would have to go into bankruptcy. Confidence in the fledgling company was low. It was then that a group of investors and concerned businessmen paid a visit to Ray Stordahl. Stordahl was well known in the community, having been co-owner of a successful Moorhead construction company since the late 1940s. He was even one of the initial investors in Moorhead Plastics. Stordahl had since sold his construction business and was working in real estate when he was contacted by members of the Greater Moorhead Development Corporation and other stockholders and told of their concerns over the new boat company. “They came to me and said, ‘We need help over there at Silver Line.’” Stordahl later recalled. “We need somebody we know with business experience to get us the real picture.” Stordahl agreed. His first task was to smooth things over with the suppliers and convince local banks that it was still a sound investment. He helped bring in an additional $50,000 from the stockholders and $40,000 from two local banks. Stordahl joined Moorhead Plastics as Business Manager in late 1960. Because of the cash-strapped status of the company, he agreed to be paid in company stock for the first six months. The combined efforts of John Buckman, the Greater Moorhead Development Corporation, and Ray Stordahl were a perfect match. Sales more than doubled in 1961, reaching $348,900. By 1964, sales had reached $1.2 million under the watchful eyes of more than 250 stockholders. Just two years later, production reached 2,200 boats with sales of over $3 million. They offered 22 models built by 110 employees and sold through 227 dealers in 42 states. One dealer's strategy was to tell prospective customers that, " . . these are real Minnesota boats from the land of 10,000 lakes, put together by skilled Norwegian craftsmen." In 1967 Silver Line introduced their tri-hull and bought an entire year's production of Chrysler 110hp motors. Things were going great for the young company, now competing head-to-head with heavy-hitters like Crestliner, Glastron and Larson. Production was up to 4,000 boats annually, and Silver Line employed around 300 people, roughly half of them women. The product line had expanded to include Yukon King snowmobiles and Atlas trailers in an attempt to stabilize otherwise seasonal demand. By the end of the year the decision was made to change their name from Moorhead Plastics to Silverline, to better reflect their products. Although the snowmobile idea was a good one, in practice it proved problematic. Manufacturing flaws resulted in returns for service and lagging sales. At the same time, Arctic Enterprises, maker of Arctic Cat snowmobiles, was looking for a summer product to help stabilize their sales. Since many stockholders owned stock in both Minnesota-based companies, a merger was the obvious solution to both problems. The merger with Silverline took place in 1970 and production expanded into other types of boats, snowmobile parts and even outdoor clothing. John Buckman left Silverline just before the merger and Ray Stordahl was appointed President of Silverline and Vice President of the marine division of Arctic Enterprises. Up to this point, all hull and deck design work had been done in-house. Starting in 1970, Silverline contracted with Jim Wynne for some hull designs, most notably the 16' Aruba, a single cockpit sport runabout similar to the Donzi Sweet 16. As the company continued to grow, their boats got bigger and more expensive, ranging from $2,000 to $25,000. Employment exceeded 500 workers by 1977 and sales reached $15 million. A new factory was constructed in Fort Walton Beach, Florida in 1979 to build much larger boats for the ocean-side market and for export overseas. By this time Arctic Enterprises had also acquired Larson and Lund boat companies. Silverline boats continued to be produced, but were difficult to distinguish from the others. In fact, a number of Larson boats were made that were nothing more than re-badged Silverlines. THE FORUM, Moorhead, Minnesota, "The 20th Century In Review, Good while it lasted, Silverline boats once the talk of the town, nation" by Gerry Gilmour. NOTE: This article is available for $1.95 fee through The FORUM's online archives. The Clay County Historical Society Archives, Moorhead, Minnesota provided a clipping collection of local magazine and newspaper articles pertaining to Moorhead Plastics and Silverline boats. Special thanks to Ray Stordahl for his help and hospitality while I was in town. The information he shared is priceless, and essential to the work of this website. Other photographs and information were graciously provided by boat historian Lee Wangstad in response to my inquiries through FiberGlassics.com. If anyone has more information, please e-mail me.